Can you believe we are already in November where is the time going? Just imagine if you volunteered for any of the open positions time would go just as fast (half the year already over) and you would feel good knowing you did your part in keeping our guild active. Saturday Nov 10 is the post card workshop and there are still a few openings best way to get your President’s Challenge well on its way. Hope you have been stitching so that we can see more of that wonderful Show and share, did you happen to view the items of our last meeting on the web page? Please go to the executive page you will see there are a couple of positions that require your help! There is a whole executive of people to help you with the office you would like to volunteer for we work as a team, I am sure even past members that have been on the executive would give friendly advice. If you are able to fill any of these positions or thinking of it please email our president she would be glad to hear from you. Many hands make lighter work as the saying goes but also if these positions are not filled that means that we are also losing out on these special programs due to no one to chair the office. Thank you for considering! Your quilt guild. We had great fun with our President starting the meeting with her journey of over 30 years of quilting starting with her first quilt. The library is open from 6 p.m. to 6:50 p.m. Your newsletter is posted for Oct! Also check under challenges to review the Presidents challenge looks like we can have lots of fun with this 40 and Fabulous theme. Quilt show season is in full swing Oct listings are on the side. I will be going to the Erie Shores quilt show in Leamington next weekend. There should be loads of inspiration at the shows to help you decide how you want to celebrate our 40th year! Wishing you and your family the best of Thanksgiving weekend. 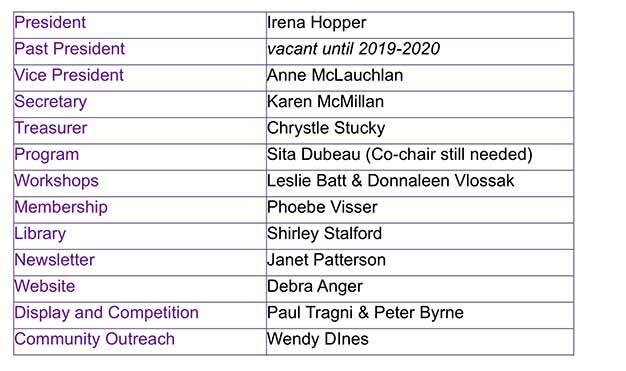 Please note our first meeting is at a different location Crescent School 2365 Bayview Avenue in the Theatre (Centre for Creative Learning) we will be back to our original meeting place in October. If you have not renewed yet, this is the time to do it! we have a wonderful year of guest speakers/workshops and vendors you don’t want to miss. Take a seat and read your newsletter for all the exciting events for 2018-19. If you have renewed already we look forward to seeing you at our first meeting of the season. I would like to thank Valerie for all her time/ years she has given in making the web page unique and entertaining for your on line viewing, giving you up to date access anytime. I would like to promote volunteering to keep your guild fresh and full of new ideas think about it as the year unfolds ask questions about what we do on the executive maybe by the end of the season you will get incentive and have some great new ideas for the guild that you can introduce to our guild by taking an office. The May meeting closes out a great year for York Heritage Guild, with thanks to the old executive and in with the new, photo below. Then the guild viewed and voted on the quilts from the President’s Challenge. Armed with fabric donated by Rosemary Hamelin’s family, guild members made quilts inspired by Rosemary’s life- geologist, mother, world traveller and quilter. Such a great display made choosing a favourite very difficult. Click here to see all the quilts that were entered in this challenge. The big reveal of next year’s lineup of speakers and workshops happened near the end of the meeting, and there was a frenzy of people getting their names on the sign up list for early registration. Looks like next year promises to be a great one! Thanks for a great year, and see you all in September! If you were not at April’s meeting, you missed a great time. Cynthia England gave a very funny and entertaining talk entitled “Why Did I Buy This Ugly Fabric?”. Then she showed samples of her ugly fabrics (skeletons, ghosts, vampires, etc etc), how she organizes and stores them, and how she incorporates them into her quilts. A truly entertaining presentation! She also displayed one of her stunning art quilts so we could see other aspects of her work, and several of the quilts made from the kits she sells. Ann Sutherland was quilter of the month, and she showed quilts she had made for a group of aboriginal children graduating kindergarten. We had quite a number of Show and Share quilts this month too! Finally, don’t forget to bring your quilt for the President’s Challenge next month! We had a full night of quilts at our March meeting, with lots of fun things happening. Donnaleen reminded us to let her know if you are entering the President’s Challenge (fabric from Rosemary Hamelin’s stash, due at our May meeting!) – and the size of your quilt, estimates are OK. Valerie gave a brief history of Quilts at the Creek, and there will be volunteer sign-ups, quilt applications and workshop sign ups at the Q@C table at our April and May meetings. She also gave examples of what a challenge quilt could look like, if you choose to enter this. Wendy Dines reminded us that Community Quilts is hoping to get back some of the quilts (and the pins…) that have been taken to be quilted. There are a few more waiting to be quilted too. And of course there was luscious fabric from Hyggeligt Fabrics to drool over! Our speaker for the evening was Bethanne Nemesh who entertained us with her journey to find her personal quilting style, and amazed us with her artistic and technical abilities. What great quilts! To see better details of her work, check out her website here.